The world stands at crossroads as tensions between nations are simmering precariously. Russia and the USA are in a dangerous arms race, India and Pakistan were close to a full-blown war and countless other conflicts around the globe threaten to boil over. Any war between nuclear powers could result in horrific destruction affecting all of mankind. 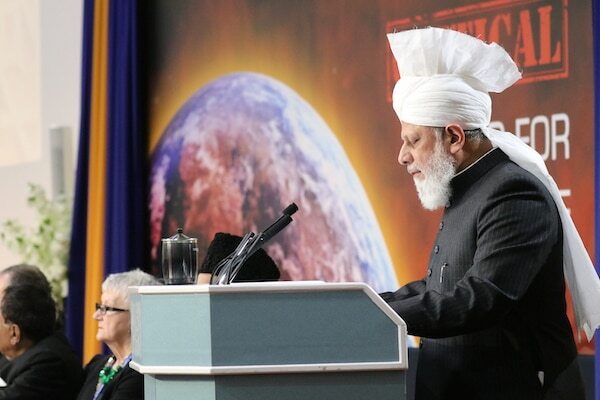 Against this backdrop with the world seemingly hurtling towards catastrophe – at the landmark 16th National Peace Symposium UK on 9thMarch 2019 at Britain’s largest mosque, Baitul Futuh in London – the Worldwide Head of the Ahmadiyya Muslim Community took to the podium to deliver a critical message of peace. Addressing an assembled audience of more than 1000, including 700 dignitaries and guests from 30 countries, including Ministers, Ambassadors of State, Members of Parliament, faith leaders and others, the event was beamed around the world through the media and TV stations. The Review of Religions is proud to present the full transcript of the address delivered by His Holiness on this historic evening. We urge our readers to forward this vital message widely to all their friends, acquaintances and contacts. ‘Bismillahir Rahmanir Raheem, in the Name of Allah, the Gracious, Ever Merciful. 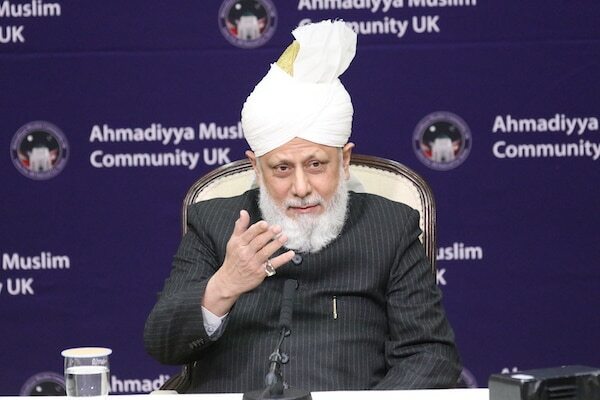 Each year, the Ahmadiyya Muslim Community hosts this Peace Symposium, in which current issues and the overall state of the world are analysed and, in my address, I seek to present answers to these contemporary issues in light of the teachings of Islam. In terms of what impact this event has on the wider world, I have said before that I do not know. However, regardless of its effect, we shall never give up our efforts to promote peace and justice and certainly, I am sure all of you share our ardent desire for true and long-lasting peace to be established in the world. Indeed, I am sure all of you hope to see an end to the many conflicts and wars that have blighted the world in recent times and for a peaceful world to emerge in which all people and all nations live amicably and fulfil the rights of one another. Yet, the tragic and devastating truth is that each year, instead of pulling back from war and conflict, the opposite is proving true. Rivalries are intensifying, new battle lines are being drawn, whilst existing hostilities show little sign of abating. The rest of the article reinforces the point that another global arms race has begun and that the threat of nuclear war should not be underestimated. In recent days, the world witnessed a sudden escalation and tension between India and Pakistan. Both countries are nuclear powers and both have built alliances with other nations, whether openly or in secret, which means that the potential consequences of a war would be extensive and far-reaching. I have expressed my view on many occasions that the leaders of some of the nuclear powers are trigger-happy and appear not to appreciate the truly grave consequences of nuclear warfare. Not only do such weapons have the power to annihilate the countries targeted, but also have the potential to destroy the peace and stability of the entire world. Thus, it is imperative that nations and their leaders do not focus only on their own national interests, but consider what is best for the world at large. Dialogue with other nations and communities is vital and each party should work together with a spirit of tolerance and with the shared objective of developing true and sustainable peace in the world. Hence, expert commentators and experienced politicians are reaching the conclusion that nuclear war no longer remains a remote and distant prospect, but is a growing threat that can no longer be discounted. If we glance at just a few of today’s pressing issues, it is clear that the world is heading in an ominous direction. During the past year, the United States claimed with a degree of confidence, that it was close to securing a historic peace deal with North Korea, but in recent days, it has become clear that nothing of substance has been achieved. Conflict in the Middle East continues to rage. Over almost a decade, Syria has been ravaged by bloodshed and torn asunder. It is said that the civil war is now edging towards an end, but what has the past decade achieved except the death of hundreds of thousands of innocent people and the displacement of millions of others? Nothing positive has emerged and the future remains uncertain and precarious, as tensions rise between nations who have their own vested interests tied into the future of Syria. On one side, Russia and Turkey are aligning, whilst on the other side, the United States and Saudi Arabia are joining together and are ratcheting up pressure on Iran and seeking further sanctions against them. Political experts are openly expressing that the objective of these nations is to dominate the Middle East. Another flashpoint and source of conflict are the worsening relations between Turkey and the Kurdish groups who seek autonomy. Thus, the world is stuck in a vicious cycle of conflict and counter-conflict, as rivalries ferment and hatreds become ever more deeply entrenched. No one knows where such issues will finally lead us or how horrific the consequences will prove to be. What I have mentioned is just the tip of the iceberg. There are many other issues of concern that threaten the peace and well-being of the world. For example, it is said that the terrorist group Daesh is on the verge of collapse and that their so-called Khilafat is finished. Yet, experts also warn that though Daesh has lost its territory, its hateful ideology persists and its members who have survived are now scattering and could eventually regroup and perpetrate attacks in Europe or elsewhere. Furthermore, nationalism has reared its ugly head again and far-right parties are gaining popularity across the Western world. They may not have secured outright political majorities, but unless justice at all levels of society prevails, they will continue to gain support. One of the core reasons underpinning their popularity has been widespread immigration, which has caused resentment and a belief that existing indigenous citizens are being short-changed in order to fund and support immigrants. I have spoken on this issue at length in the past and so I do not need to go over old ground. Suffice to say, that if genuine efforts are made to cultivate peace and to help all countries achieve their potential, the desperation of people to flee their homes would automatically subside. All that most people desire is the ability to provide for their families and it is only when such opportunities are denied to them that they seek to leave their homes in search of a better life. Accordingly, the long-term solution to the immigration crisis has to be to establish peace in war-torn countries and to help the local people, who have been forced to endure lives of misery and danger, to live peacefully. In the short term, where refugees or asylum seekers come to the West due to the prevailing political or religious conditions in their own countries, they should be treated with dignity and respect. At the same time, whatever support they are given should not be at the expense of existing citizens. Immigrants should be strongly encouraged to enter employment as soon as possible, rather than living off benefits for long periods. They should work hard, seek to stand upon their own two feet and contribute positively to their new society. Otherwise, if they are continually funded by taxpayers’ money, it will inevitably lead to grievances. Indeed, it is my belief that the underlying cause of most resentment in society tends to be economic and financial frustration. Certain groups take advantage of such anxiety by laying the blame at the feet of immigrants or at the followers of religion and incite sentiments of hatred towards them. Thus, an impression has developed in Europe that Asians, Africans and particularly Muslim immigrants are a threat to society. In the United States, there are similar fears regarding Muslims and also Hispanics seeking to enter the country through Mexico. Nonetheless, I firmly believe that if the major powers set aside their own vested interests and strive earnestly towards improving the economic conditions of poorer nations and treat them with sympathy and respect, such issues would never arise. In my speech seven years ago, I focused upon the importance of removing the fears of the public about immigration and emphasising the benefits of unity. However, people’s concerns were not adequately addressed and so increasingly, people across Europe have come to question the benefits of the European Union. The starkest example is, of course, Brexit but in many European countries, such as Italy and Spain and even Germany, far-right or nationalist parties are gaining popularity and winning seats at the political table through which they are striving to further weaken the European Union and pursuing an anti-immigrant agenda. Consequently, the Islamic viewpoint is that peace can best be achieved through unity. Yet, regretfully, instead of uniting, we are seeking separation and prioritising our individual interests over the collective interests of the world. I believe that such policies will, and already are, undermining the world’s peace and security. According to Islam, for peace to prevail, justice between nations is a prerequisite. Where countries face difficulties, other nations should seek to help them selflessly, without pushing their own agendas. For example, the Holy Quran states that if there is a war or conflict between two parties, other nations should mediate impartially and seek to bring about a peaceful settlement. However, if one side continues to be unjust and does not move towards a peaceful outcome, then the other nations should unite together to stop the aggressor. Once the aggressive nations or party refrains from wrongdoing, Islam categorically instructs that revenge should not be sought through unjust sanctions or by plundering their resources. However, time and again, we have seen examples of countries that have intervened in war-torn nations or given aid to deprived countries on the pretext of bringing peace, but have attached strings that enable them to take control of the weaker country’s resources. Rather than being content with their own wealth, powerful countries seek to assert their control over weaker nations. As I have said, the root cause of frustration and the resulting hostility, whether in the East or the West, is economic injustice and so it is essential that a concerted effort is made to bridge the economic divide amongst nations and their people. Furthermore, we must unite in our efforts to end all forms of extremism and prejudice, whether religious, racial or of any other kind. Where it is clear that people are suffering and that their leaders are not protecting their rights, those international organisations founded for the sake of preserving the peace of the world, notably the United Nations, should exercise lawful and proportionate pressure in order to defend the rights of law-abiding citizens and to push for peace and justice. In terms of Islam, you may wonder what it can teach us about bringing peace in the world when much of the instability and conflict in recent years has centred around Muslim countries. Yet the sorry state of those nations is because they have moved far away from the true teachings of Islam. To get an accurate portrayal of Islamic governance and leadership we should look to the era of the Founder of Islam, the Holy Prophet Muhammad (sa). 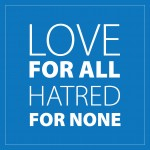 After the Holy Prophet (sa) migrated to the city of Madinah, he formed a covenant with the Jewish people, whereby the Muslims and the Jewish citizens were to live together peacefully and with a spirit of mutual sympathy, tolerance and equity. The covenant proved to be a magnificent charter of human rights and governance and ensured peace between the different communities living in Madinah. According to its terms, all people, regardless of their faith or ethnicity, were bound to respect the rights of one another. Freedom of belief and freedom of conscience were cornerstones of that treaty. Unity underpinned the agreement, whereby if Madinah was attacked or threatened, the Muslims and Jews would join forces to defend it together and as one. Further, each community had the right to solve their internal issues according to their respective beliefs and customs. History testifies to the fact that the Holy Prophet of Islam (sa) upheld every aspect of that agreement. Hence, according to the Quran, justice requires that a person is willing to testify even against himself and his most loved ones in order to guard and protect the truth. The second level of engagement advocated by the Holy Quran is that a person should not only be just, but should go beyond it by doing ‘good to others’ by manifesting generosity and forgiveness. As I have already mentioned, the Holy Quran teaches that once you have successfully stopped an aggressive nation from inflicting further cruelties, you should not seek revenge or impose hardship upon it. Rather, you should seek to help them build up their economy and infrastructure. Where this will help them, it will also help you in the long term. If those countries, who have been centres of war or division, are enabled to prosper economically, they will no longer harbour frustrations or bear hatred for other countries. Nor will their people be forced to migrate. This is the wisdom underpinning the Islamic teaching of going beyond basic justice and exhibiting kindness and compassion. The third level of engagement taught by the Holy Quran is to treat others in the same way that a mother treats her child, which is the most selfless form of love, as it is rendered without any expectations of reward. To treat others with this benevolent spirit is not easy, but this should be our constant aspiration. Ultimately, to bring about peace, whether in Muslim nations or at a broader international level, it is necessary that at the very minimum, the demands of justice are fulfilled by governments so that all people are given their due rights and that selfish vested interests give way to what is fair and right. Furthermore, international institutions, such as the United Nations, should treat each country equally, rather than bend to the will of certain powers. This is the means of peace. This is the roadmap to a better world. This is the only way we can prevent mankind from sliding further towards grave peril. With these few words, it is my heartfelt prayer that may Allah the Almighty enable true peace to emerge and may the long shadows of war and conflict that hover above us be replaced by blue skies of peace and prosperity. I pray for an end to the frustrations and deprivation that have plagued the lives of countless people and have fuelled devastating wars and grievances across the world. Instead of seeking to dominate others and assert their own rights, I pray that nations and their leaders come to see the benefit of fulfilling the rights of one another. Instead of laying the blame for the world’s problems on certain religions or people of particular ethnicities, I pray that we show tolerance of each other’s beliefs and customs and value the diversity within our societies. I pray that we come to see the best in humanity and use each other’s strengths and skills to build a better world for our children and to cultivate lasting peace in society. Surely, the alternatives do not bear thinking about. Earlier, I quoted several experts who have warned of nuclear warfare and of a spiralling global arms race. Those articles, and many others, give weight to the belief that the world is hurtling towards a titanic catastrophe, the like of which mankind has never seen before and one that will be impossible to contain. According to some estimates, the effects of a nuclear war could reach 90% of the world. Furthermore, if there is a nuclear war, we will not only be destroying the world today, but we will also be leaving behind a lasting trail of destruction and misery for our future generations. Hence, we must pause and reflect on the consequences of our actions. We should not consider any issue or conflict, whether within a country or at an international level, to be insignificant. Whether we are dealing with economic issues, or immigration or any other crisis we must show tolerance and strive to break down the barriers that divide us. We should utilise all of our energies and faculties to pursue peace by seeking to end every conflict amicably, through dialogue and mutual compromise and by fulfilling the rights of one another.